Preeclampsia is a pregnancy-induced condition that typically causes a dangerous rise in blood pressure. After birth, the risk of complications associated with the pregnancy-induced condition is thought to be resolved, but that may not be the case, according to a new study published in The Obstetrician and Gynaecologist. Researchers reviewed an existing study on women admitted to the hospital up to 24 days post-delivery. Sixteen percent of the women developed eclampsia, nine percent developed pulmonary edema and one woman died from suspected complications. According to recommendations from NICE, a published set of guidelines for care after birth, blood pressure should be noted in all women six hours after giving birth. Women should also be educated on the signs of high blood pressure or preeclampsia during the first postpartum medical interaction. Due to the possible prolonged effects of preeclampsia, blood pressure screenings should continue after discharge from the hospital. 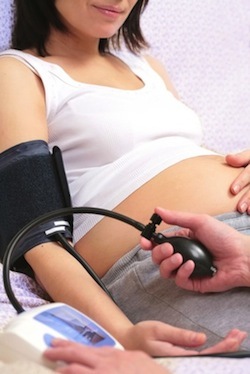 Elevated blood pressure is common postpartum, even in women without preeclampsia. Researchers suggest monitoring blood pressure for at least 72 hours post partum to ensure high blood pressure does not persist after birth. Prolonged or dangerously high blood pressure can lead to further health risk and death. Researchers suggest extra time in hospital care and continued blood pressure monitoring. "Women with pre-eclampsia should be encouraged to delay discharge and once they leave hospital the community midwife should monitor blood pressure for the first 2 weeks. This is then followed up at the 6-week postnatal visit. If symptoms persist there may be an underlying cause." In future pregnancies, women with a history of preeclampsia should be made aware of the symptoms of the condition, possible treated with low-dose aspirin and have blood pressure readings watched closely throughout the pregnancy.